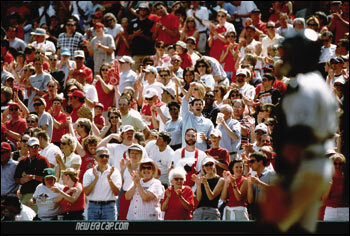 Cardinals’ Fans First Public Reaction to Mark McGwire…A Standing Ovation? Posted on January 17, 2010 by Notorious B.U.D. Congratulations Cardinals fans! Your hypocrisy knows no ends. Not to go all Steven A. Smith on you, but quite frankly that’s preposterous! I hate to go all Mike and Mike on you, but c’mon man! And finally, I really can’t stand to go all MSN Messenger on you, but WTF Cardinal fans? Mark McGwire lies to you for years and then goes on national television and lies again—and you give him a standing ovation? I might expect this kind of thing from Yankees fans, who have continually shown themselves to be completely delusional, but I thought St. Louis held it athletes to a higher standard. The level of hypocrisy among sports fans is downright shocking and they’ll catch up to politicians soon if they keep up this kind of behavior. Fans are willing to crucify Barry Bonds, Rafael Palmeiro and everyone else from the steroid era, yet when McGwire says he’s “really sorry” Cardinal followers treat him like nothing ever happened? I realize that McGwire admitted what he did (sort of) but that doesn’t mean he should get a free pass and be welcomed back with open arms. McGwire broke the law, cheated the game and lied about it until it was convenient for him to come out with the “truth”. Some people deserve second chances but Big Mac isn’t one of them, at least not until he is ready to come clean about what he really did all those years. Mark McGwire was arrogant enough to think that baseball fans would believe whatever he had to say about the past. Apparently he was right.